This is the second installment in a series of nine posts in which I transcribe the will of my Revolutionary War ancestor, Captain Thomas Hemphill. In the first post, we learned that Captain Thomas’ will was contested by two of his children and a son-in-law, and that the date usually seen for his death may be wrong. Let’s see what page two1 has to offer. proof of the handwriting of the Testator Thos Hemphill ded. Said Land will Show their situation and Dementions. The copy of the will starts on this page, so we are starting to get to the meat of things. The verdict in the appeal is also noted on this page: the jury found the will to be valid in a session held in March 1830. He named Andrew as his son and bequeathed him three tracts on land, one on Silver Creek, one in Buncombe County and one in Burke County. Andrew was either the second or third son, after James. Silver Creek, I believe, is in an area that remained in Burke County when McDowell County split off. I need to look into this further. He named Thomas as his son and bequeathed to him the homeplace, which is on land purchased from John Davidson and one hundred acres. . . 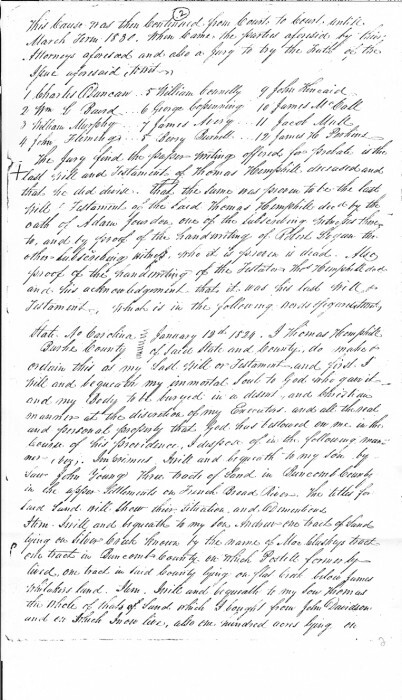 Check back next Monday for page 3 of Captain Thomas Hemphill’s will.